If you know some interesting facts about diamonds, it would make you appreciate their rarity and exquisite sparkle beyond the looks. Apart from being the most beautiful and popular gemstone, diamond has a glorious past and that makes it special choice as engagement ring adorning the special finger. 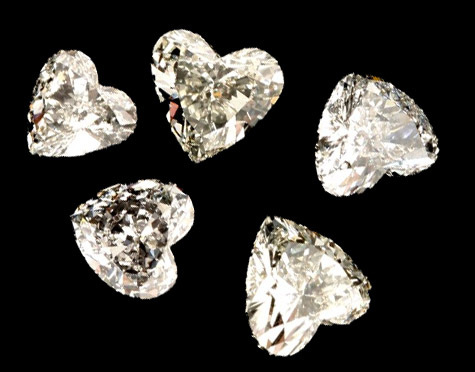 Basically the word ‘diamond’ has derived from the Greek word adamas, which means unconquerable, indestructible etc. Diamonds are considered to be one of the hardest substances on earth and they are very durable. However if not handled appropriately even a well cut gem can be scratched or chipped. Diamonds are natural substances that are formed under tremendous heat and pressure deep beneath the Earth’s crust. Rough diamonds are brought to the surface as a result of volcanic activity. They are also revealed while mining old volcanoes. There are some very rare diamonds that are formed by meteorite impacts that generate sufficient heat and pressure to crystallite carbon. Most diamonds have some amount of impurities and pure untainted diamonds are exceptionally rare. Nitrogen is the most common impurity found in diamond. The gemstone attains a brown or yellow color as nitrogen is added to the crystal lattice and depending on the amount of nitrogen and its concentration, the color of the diamond would be determined. Diamond can be cut and sculpted into a variety of shapes due to its geometric crystal lattice. The most popular shape would be the round diamond, however princess, emerald, oval and marquise shapes are also popular choices for engagement rings, wedding rings and other jewelry.